The recent show at the de Young in San Francisco, “Botticelli to Braque: Masterpieces From the National Galleries of Scotland,” was a decidedly mixed bag. Here we admire three particularly fine pieces; next week we’ll consider some of the duds and their deadening effect. 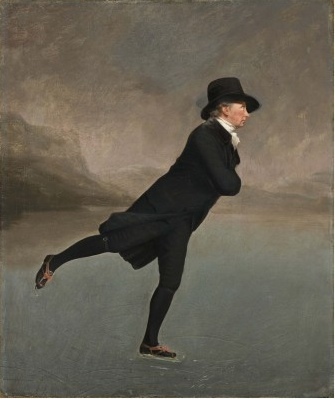 Particularly fine: “The Reverend Robert Walker Skating on Duddingston Loch” (c.1795) by Henry Raeburn. Landscape and sky are grayed and softened, and the darks of the reverend’s clothes intensified, to maximize contrast. The overall effect is very strong, almost abstract. And droll. You don’t often see consciously droll portraits. 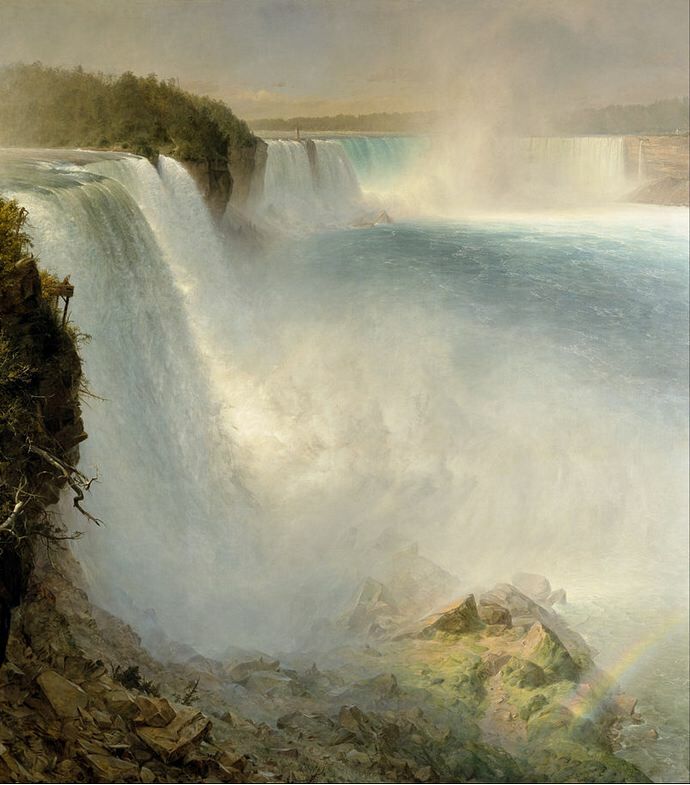 And then “Niagara Falls From the American Side” (1867) by Frederic Edwin Church. A big piece, almost environmental as you approach it from across the gallery. The effect is naturalistic, but this is an artfully structured piece. The farther dark bit of forest contrasts with all those light, foamy shapes and keeps them from fading into mush. The nearer dark cliff drops, softening as it goes, and then curls upward and disappears into the spray. The eye follows, drawing you into the action and also providing some definition, some hard shapes, in the middle of all that delicate mist. The figure on the observation deck provides the scale. It seems very odd that such a uniquely American view normally lives in Scotland. 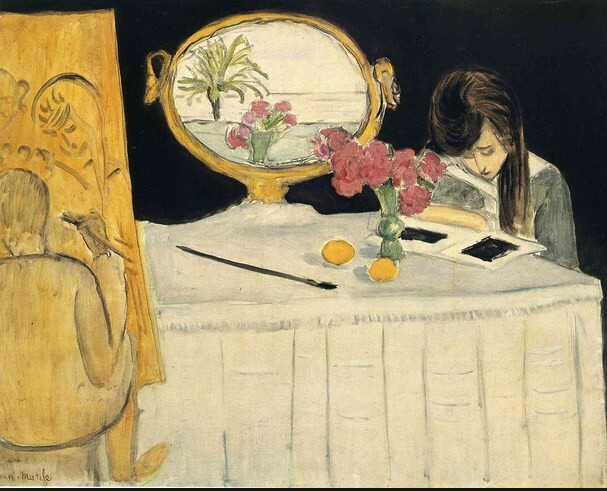 And finally, “The Painting Season” by Henri Matisse (1909). Thinly, wetly painted, with very direct drawing of the shapes. The intensity of the blacks is what holds it together, together with rhyming lines (the diagonals of the painter’s brush, brush on the table, edges of the book, edge of the table, her arm, collar, shoulder; the horizontals of the canvas, the table front, the lines in the mirror) and shapes (the head on the canvas, the painter’s head, shoulders, hips, the mirror, the flowers, the vase, the lemons, her hair). Matisse’s loose drawing (like the length of the painter’s forearm, or the wandering shape of the mirror) can sometimes get sloppy, but here it’s superbly descriptive. If it were more “correct,” the organizing details would seem mechanical, and the freedom from pictorial literalism merely illogical.